Oslo’s Holmenkollen Ski Jump is called a “national facility,” but it’s long been a drain on the city’s finances. 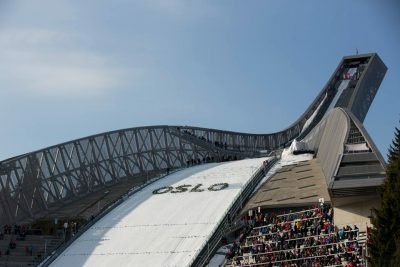 Now Oslo officials are reviving efforts to secure more state funding to help bail them out of Holmenkollen’s costs, which they feel are claiming far too much of the capital’s overall sports budget. Newspaper Aftenposten reported recently that fully 41 percent of the money Oslo spent on its sports facilities from 2005 to 2015 went to Holmenkollen. Its reconstruction and expansion, necessary in order to host the World Championships in Nordic skiing and ski jumping in 2011, generated famously huge budget overruns. Its operation and maintenance since have also been expensive. What’s even more aggravating for local sports enthusiasts is how the ski jump itself is a facility that can’t even be used by a broad majority of the public. While the refurbished and flood-lit cross-country skiing trails around the ski jump are mostly open and available for use by recreational skiers, only professional ski jumpers can soar off Holmenkollen. Ski jumping itself, meanwhile, has lately become a niche sport in Norway. While Holmenkollen alone commands nearly half of Oslo’s taxpayer-funded sports budget, just 36 percent when to construction and maintenance of other sports halls and facilities. Only 6 percent, for example, went towards the playing fields with artificial turf used by far more football clubs and other sports programs. Oftedal noted that since the City of Oslo “has to pay for Holmenkollen, it comes at the expense of the broad spectrum of sports.” The city is also spending around NOK 28 million a year on operations alone, in addition to paying down the costs of building Holmenkollen. Oftedal admits that Holmekollen also has the dubious distinction of being “four- to five times more expensive to build than budgeted.” Oftedal thinks the state should therefore take on more responsibility for helping to finance Holmenkollen, with a requested bailout among the many things facing Prime Minister Erna Solberg’s new expanded government coalition set to be unveiled on Wednesday. Rina Mariann Hansen, Oslo’s city government leader in charge of culture and sports from the Labour Party, agrees. “The state should take greater responsibility for building national facilities,” Hansen told Aftenposten. She notes how the state built Oslo’s Opera House, and the new National Museum now under construction, while the city is responsible for sports facilities. Bård Folke Fredriksen, state secretary in the Ministry of Culture from the Conservatives, acknowledges the difference but sees no reason for the state to pay more of Holmenkollen’s costs. “The state doesn’t own and operate sports facilities, the local municipalities do,” Fredriksen told Aftenposten. He noted that the state does contribute financially to facilities that can be arenas for international competition in Norway, but their local communities have wanted them and remain responsible for them. Prospects for a state bailout thus appear slim.